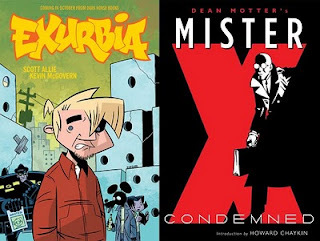 Two interesting books I did not entirely enjoy: Exurbia and Mister X: Condemned. The former is clearly a passion project, written by Dark Horse editor extraordinaire Scott Allie; the latter is a retro British mashup of The Fountainhead and, I don't know, some kind of low-budget "psychological" horror movie. They weren't for me, but maybe they're for you.